We climbed Slate Canyon again today. I stopped at the base of the latest hill we have been trying to tackle to take some pictures and low quality video. The rest was good because I was able to go a lot father up that hill then I had before. 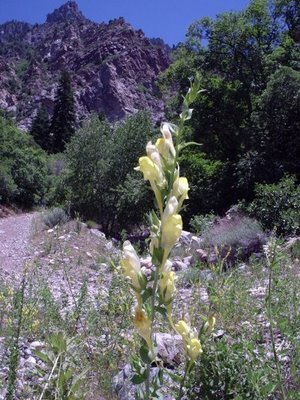 I saw these yellow flowers along the side of the of the trail today. I thought it looked like a wild snapdragon. It seemed like a nice innocent wild flower just making things beautiful. But when I looked it up on the Internet I discovered it is a noxious weed. Oh well it sill looked nice. Thought: Successfully climbing Slate Canyon is all about luck. Skill and strength simply increase your odds.